HomeShopDesignsFunny Designs...Who the Tweet is Sam Peabody? Who the Tweet is Sam Peabody? A mnemonic is a memory aid. Birders sometimes use words to remember certain bird songs. A popular mnemonic for the song of the White-throated Sparrow goes "Poor Sam Peabody." 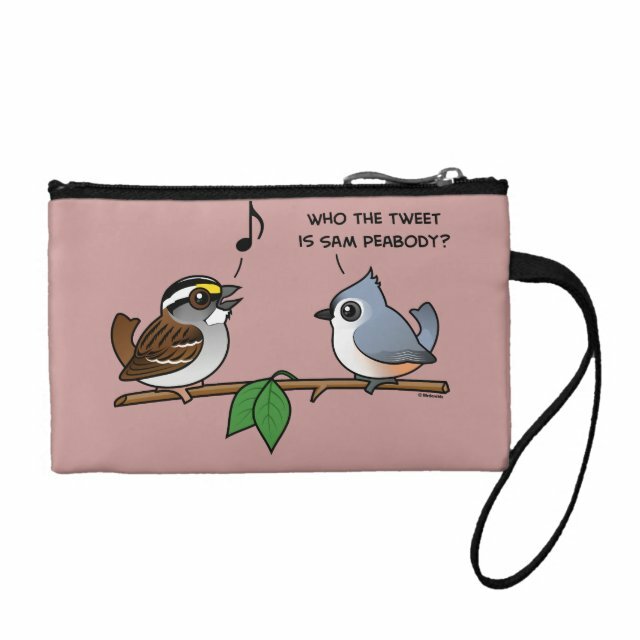 This cute original design shows a White-throated Sparrow singing his song, while a nearby Tufted Titmouse is a bit confused. "Who the tweet is Sam Peabody?" This is a funny gift idea for any birder! You can customize this gift, too! Move the little cartoon image around on the product, change the background color or product style, add text or images -- make it your own!